← So parents shouldn't be married? 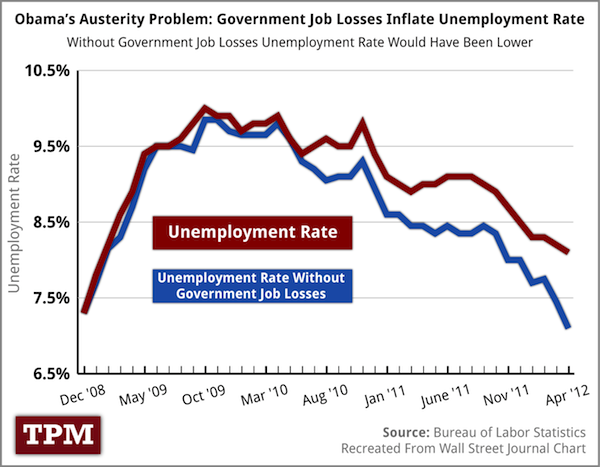 As numerous people have noted, one thing that distinguishes the current depressed economy is the loss of government jobs. The private sector has been recovering nicely, and if fact it would likely be doing even better were it not for the former government employees -- teachers, police, maintenance workers, and many others -- who have been laid off by state and local governments and hence haven't been able to afford as many goods and services. Yes, you'll encounter some people who seem to think that it's the other way around, that government employment expanded and the private sector shrank, a claim Tim Pawlenty was making during his brief candidacy for president, but that simply wasn't and isn't true. For more information, see the Talking Points Memo article from which this is taken. Must be Bush's fault all those government workers were let go, huh? Yeah, that's the ticket. Bush's fault. Ah what the hell, it has been working for 3 years now.